This Memorial Day weekend, we reflect on the heroism of U.S. service members who made the ultimate sacrifice defending our country. 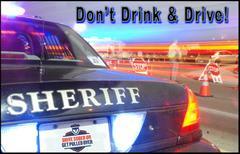 The Sheriff's Department will also make sure San Diego's roadways are safe from impaired drivers. AAA says more than 41 million Americans will be traveling this holiday weekend. A majority of those travelers – almost 37 million – will be driving. The Sheriff's Department will be conducting extra DUI patrols beginning Friday, May 25th at 7:00 p.m. and ending on Tuesday, May 29th at 3:00 a.m.
Sheriff's Deputies will also be holding a DUI checkpoint in the City of San Marcos on Friday, May 25th from 7:30 p.m. to 2:30 a.m.
DUI doesn't just mean booze. It also means driving under the influence of prescription drugs or marijuana. During the Memorial Day DUI enforcement period in 2017, the Sheriff's Department arrested 10 people for driving under the influence of drugs or alcohol. During the same period in 2016, deputies arrested 20 people for DUI. "Don't put your life and those of others in danger by driving while impaired," said Sheriff Bill Gore. "If you are caught driving under the influence this Memorial Day weekend, you will go to jail." To watch our public safety video on the high price of impaired driving, follow the Sheriff's Department on VIMEO: https://vimeo.com/172481905. Funding for the Memorial Day weekend DUI patrols/checkpoint was provided by a grant from the California Office of Traffic Safety (OTS) through the National Highway Traffic Safety Administration (NHTSA).